When using market survey data to determine the salary range for a position, you could use the 10th, 50th, and 90th percentiles as your minimum, mid-point, and maximum for the range. Or, maybe the 25th, 50th, and 75th percentiles would do okay. One of the problems with either of those options, though, is that those points tend to fluctuate with the survey data so your range spread varies from position to position. Instead, you may want to calculate a consistent range spread based on the mid-point of the salary data. You just have to decide which mid-point to use—the mean or the 50th percentile. Either way, there is a simple method for determining the min, mid, and max of a salary range when only the mid-point of the survey data is known. The key is to pick one range spread rate for each job type in your organization, document it, and be consistent in how it is applied when setting the salary range for each of the jobs in a given job type. Let’s use 50% as our range spread. In this case, the midpoint of our rage is $135,500. To find the minimum, divide the market rate by 1.00 + ½ of the range spread. 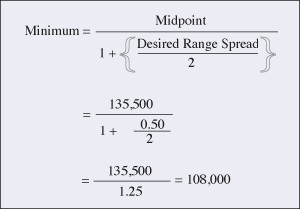 To find the maximum, multiply the minimum times 1 plus the range spread. This creates a salary range that has a minimum of $108,000, a mid-point of $135,500, and a maximum of $162,000. This simple formula can be used to establish a salary range for any job based on the mid-point of available salary market data. If you’d like to see this formula in action, check out the BLR Job Grade Rate Range Calculator.